Andy Murray injury: what is hip resurfacing and will it help? Photo: Andy Murray injury: what is hip resurfacing and will it help? Andy Murray has been troubled by hip pain that has affected his tennis performance for the past 10 years. He has already undergone one bout of surgery and is now considering another operation. He has also spoken about retiring from tennis altogether – in the hope that not stressing his hip joint, with constant running back and forth on hard hitting tennis courts, will help improve his pain. Murray himself hasn’t been specific about the nature of his injuries but given that he is debating having an additional operation it suggests he most likely has quite severe osteoarthritis. This is a type of joint disease commonly seen in older people – but increasingly also in young and middle-aged people typically following a sports-related injury or a career in elite sports. The most common osteoarthritis symptoms are joint pain, stiffness and reduced function. Intuitively, one would think the reasons for the pain should be visible on X-rays and MRIs and be fixable with surgery. In young people with hip pain, having bone bumps on the ball or socket of the hip joint has been suggested as a cause of mechanical blockage and pain. Recent research shows two out of three athletes have bone bumps on X-rays, regardless of whether they have pain or not. It seems that it is the rotational movements required in impact sports – including tennis – that causes the development of the bone bumps. This probably happens during the period of rapid growth (ages 11 to 16 years-old) when adolescents are participating in youth sports. How common are hip problems? Many athletes suffer from hip problems, especially in high-impact sports such as football, ice hockey and martial arts. And just like Murray, for many athletes, the hip pain can put an end to their sporting career – despite trying numerous treatments, including surgery. Around 20% of all injuries in football are related to hip and groin pain, and it has been suggested that about half of all footballers will have experienced hip and groin pain sometime during any one season. In ice hockey, hip and groin injuries account for around 10% of all injuries – and men are 30% more likely to have a hip or groin injury than women. For younger athletes and older adults, age-appropriate exercise is recommended. In people with hip pain and bone bumps seen on X-rays, the best effects seem to be found in exercise programmes that focus on strengthening for the hips and trunk, as well as balance and control during movements. It is also normal for patients to still have some pain when they exercise – but this should not stop them from exercising, as long as the pain is acceptable. Surgery can also be used – most commonly shaving and cutting is done to change the form of the ball or the socket of the hip joint. This procedure is done to address the bony bumps and the impingement they may cause. A recent study looked at people with hip pain and bone bumps, following those who fell under the care of an orthopaedic surgeon and had surgery compared to those who met with a physiotherapist and underwent a personalised hip therapy program. After one year, it was found that neither treatment was very good. People in the surgery group improved by around 20%, and those in the physiotherapy group by 14%. But the cost of the surgical treatment was ten times more than the physiotherapy treatment. And side effects were more common and severe for those having surgery. In older people with severe painful hip osteoarthritis, replacing the ball and the socket of the hip joint with metal and plastic (total hip replacement) is a good treatment option. After this procedure, nine out of 10 patients report partial or complete pain relief. But because the metal and plastic is exposed to wear, the hip prosthesis may loosen and about one out of 20 patients will have to get a new hip joint prosthesis within the first 10 years. Having to operate again is often associated with a worse outcome compared to the first surgery and is also more common in younger more active people. Hip resurfacing – which is what Murray is considering – has been put forward as an alternative surgery in young and active men. During hip resurfacing the ball of the hip joint is kept and covered in another material, most commonly metal. The use of resurfacing is very controversial. The first studies where small groups of well-selected people were followed showed promising results, but more recent studies comparing hip resurfacing to total joint replacement actually show no difference in results between the two treatments. Obviously only Murray himself can decide what’s right for him. As he’s said in recent interviews, the option of another surgery is still available to him. He has also spoken about taking four months off to rest and then try and take part in Wimbledon. And while it may sound counter-intuitive, stopping all physical activity due to the pain is probably the worst thing he could do. It is well known that exercise relieves pain in people osteoarthritis and probably also in younger people with pain and bone bumps – but the exercise has to be varied and properly dosed. 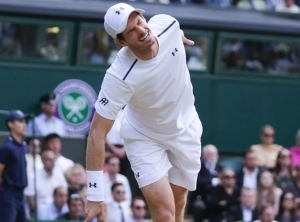 Of course, for most people the problem is doing too little exercise, but the problem for Murray is that he has been doing too much, in a repeated manner, for too long.